With my Troll in storage for now, I’m taking its big brother, Ogre, to California – a bike that’s turned out to be one of the most versatile rides I’ve enjoyed for some time. I’ll be penning some more thoughts on it soon, and my take on the pros and cons of the two Surlys. In the meantime, this is how I’ll be rolling – along with help from public buses and trains. This lean setup includes everything I need for 4 season travel, a cookset, all my electronic gismos, a few lenses, and food storage space for a few days. I won’t extol the virtues of pannier-less touring and ponder its downsides right now. But if you think travelling like this is unrealistic for more than a few weeks, check out Joe Cruz’s inspiring blog, charting his incredible, ultralight, fat-tyred adventures around South America. The Ogre's loaded up and ready to roll. Adios Santa Fe. Despite its bulk and weight, I’m using my Nikon DSLR on this trip, thanks it its improved low light capabilities over the Micro 4/3rds system. This will suit shooting without flash at the North American Handmade Bike Show. Stowage comes courtesy of an Ortlieb Ultimate 5 bar bag. Although it pushes extra weight further forward on the handlebars – not ideal – its roomy, completely waterproof, and makes the camera quick and easy to access. A necessary compromise. Without my panniers, which are currently residing in Ecuador, there’s no room for my Macbook Air on the bike. I dislike carrying weight on my back when touring, particularly on road stretches, but there’s no other way round this for now. At a touch over 1kg, at least the Macbook is extremely light for the punch that it packs. Along with the bottle cage I mount on the stem, this setup allows for over two litres of precious liquids on the bike – enough for overnighting. If I need more, I can load up the water bladder in my backpack. I’d aim to use that up first, to lessen the weight on my back. Joe added water bottle mounts on the seatstays of his Pugsley for extra H20 capacity. Although this setup is a little delicate – they catch on the ground when lying the bike down – it’s an option too. You can read his thoughts on the pros and cons of long distance bikepacking here. The Ogre’s eyeletted fork allows two Salsa Anything Cages to be quickly fitted to its blades. Each one can hold around 4 litres of light but bulky kit. I pack my tarp in one side, and Thermarest/waterproofs in the other. Look out for Porcelain Rocket’s new Anything Cage Bags – these would be a great addition to the cages. Despite the extra weight and bulk, I’m carrying a spare tyre synched to the handlebar ‘sausage’. Even though I’m unlikely to need a spare tyre right now, sourcing 29er rubber is the main issue when travelling beyond North America and Europe with this less common wheel size. I’m a fan of piece of mind, so I’m going to see how it works for future travels. 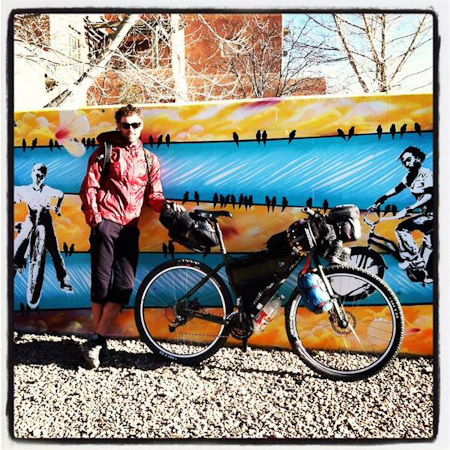 This entry was posted in Bikepacking and tagged Bikepacking, Surly Ogre on February 28, 2012 by Cass Gilbert. Cheers Rich. How’s that Siren treating you? And the Fargo? The big question is which bike is going to end up in Equador and points south? Mark, have you seen these? http://panpack.com/ I have no experience with them but they’ve been around for many years. Personally, I’d carry an ultra-lite backpack and use regular panniers or frame bags depending on the terrain I was riding. This would mean your hiking/backpack load would need to be under 20 lbs. though. The ultra-lite packs will fold up or roll to be quite small. I like 6 Moon Designs. I have the Swift. It rolls up really small, and uses a thermarest as the back support. You need to take care with how you load ultralight packs, but definitely roomy and comfortable enough for multi-day hikes. My friend has the first which she uses for commuting and she loves it. How was the Handbuilt bike show Cass? I’m riding from San Fran to Davis later this week to road test a new setup but will be too late for the bike show in Sacramento unfortunately. I’d like to check out the Vario. It’s a little pricey and weighty (1200g compared to 850g or so for a backroller) but looks really interesting. I love the blog. The photos are fantastic. I’d be keen to read your thoughts on the pros and cons of the Troll vs. the Ogre. Thanks Jack. I do have something in the pipeline on the matter… But ultimately I think it really boils down to the 26/29 debate. Both bikes are really similar (give or take a few eyelets). The Troll suits overseas travel better, and arguably smaller riders. The Ogre is great where 29er tyres/wheels are easier to source.